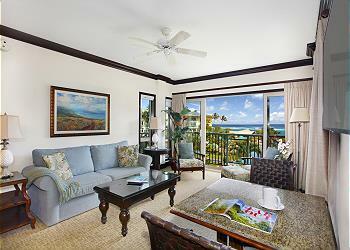 With an infamous view and refreshing trade wind breezes, this third floor suite has incredible features inside and out. Each bedroom contains a king-sized bed, while the sleeper sofa includes a high-end memory foam mattress, allowing the suite to accommodate 6 people comfortably. Pool and ocean views unfurl before you, as luxurious amenities provide a regal ambiance to admire the sunrise skies. We could not have been more pleased with the resort in general and this unit in particular. The location is an ideal jumping off point for excursions on the island. The resort is big enough without being too large. It has a great pool. There are grocery stores and a nice selection of restaurants nearby. D304 is an ideal unit. Beautifully decorated, outstanding location, incredible views, extremely comfortable. The condo was beautiful and the location was top notch. It was centrally located with shops, restaurants, and activities nearby. We would recommend maintenance look at the AC as it went out 3-times during our stay. We also recommend contacting the client when this occurs as 2 out of 3 times it just needed us to flip a few fuses to reset the system. Seemed to always happen at night and resulted in a few restless nights. If the AC worked properly or was fixed the first time we would have rated our stay 5-stars. We had the most wonderful experience at Waipouli Beach Resort. The unit was immaculate! We have had bad experiences at other resorts due to lack of sound proofing. Everything in D304 is the highest quality so no problems! We asked for a stand just for white noise and a brand new fan was delivered to our unit. Amazing service. We will definitely return and recommend this resort to our family and friends! We had a fabulous short stay in D304. My husband and I came to Kauai for a short 2 1/2 day stay, but we decided to rent out the larger unit to check out for when we take our 2 kids back in the future. We couldn't have been happier. The space in the condo was amazing. 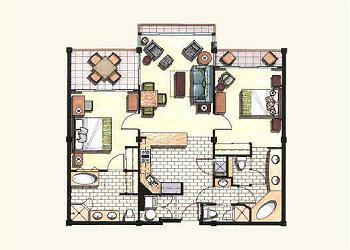 Two bedrooms with larger and cozy king beds. I didn't love the pillows because they are soft down like pillows and I stomach sleep and hate when the pillows go up around my face, but my husband loved the pillows. The bed was the most comfortable bed I've slept in when at a hotel/condo/rental. 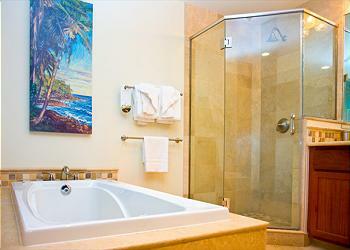 There are 2 showers, 2 large bathtubs (think master soaker tubs) and 3 toilets. 3 toilets will be amazing when we bring the kids because it always seems that everyone needs to emergently use the bathroom at the same EXACT time in our household. Everything was very clean. I have a hard time staying anywhere but my own home due to some anxiety about cleanliness and I felt very comfortable here. The air conditioner worked well and wasn't that loud. You can hear when it kicks on, but it is a lot quieter than the one I have at home which sounds like an airliner taking off. The views are incredible. My husband was like oh this will probably just be a "partial ocean view" and the photos were probably zoomed in. Not so. The photos are accurate and what you see from the lanai (there are 2 lanais - one with a full table). The sound proofing was great too. Never heard any pool noise and one night the Oasis restaurant had a live band. When we were on the lanai it was loud enough that we felt like we were right next to the bad, but with the slider closed, we pretty much couldn't hear anything (maybe a few bass notes here and there). 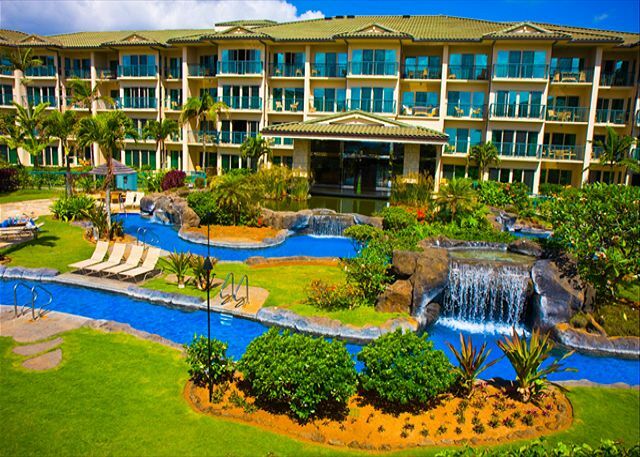 Safeway is right across the street and the rest of the resort property is very clean and well maintained. We can't wait to return. Working with Kauai Exclusives was also very easy and pleasant. Highest marks for D304. Everything top quality and in good condition. Comfortable. Great location. Service from Kauai Management was outstanding. 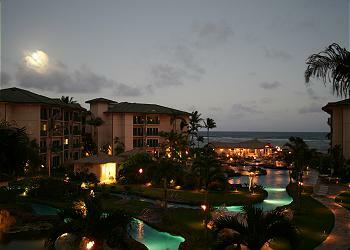 We would be happy to return to Waipouli Beach Resort again, as soon as possible in fact. Excellent swimming pools. Lovely location on ocean. Very good restaurant. Excellent communication by Kauai Exclusives. Wonderful trip to Kauai. Spent 7 days in condo D304. Condo was well stocked and had amazing views of the pool and ocean. 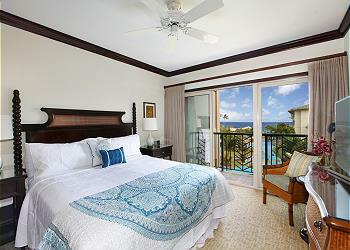 Location is convenient to shopping and all areas of the island for touring. This is our 2nd stay at this location though a different unit in past. We love this mid-island location as it is equal drives to either side of the island. This location is right across the street from a grocery store and near many places to eat. The pool is nice. The beach is not for swimming but is pretty to look at. Be aware that when you turn in your towels you do not get new ones for the next day so keep this in mind if you want nighttime swimming. They also make you wear an armband. The bed is extremely comfortable as are the pillows. Another plus is blackout curtains. A negative, the A/C was on 60 degrees the whole time but never felt that cool. It also must be on a motion sensor as it would turn on when we walked into the unit, the problem with this was it seemed to turn off at 4 am when we were sleeping and someone would have to walk into the living room for it to turn on. They supplied plenty of toilet paper and the small dish soap was enough. Only one set of hotel shampoo and conditioner are provided so you will need your own. There was left behind spices, sugar, oil, aluminum foil, etc so check the cabinets before going to the store. Coffee maker has a filter, no k-cups. There is a blender, bottle opener, etc but no cookie sheet. Could use a tv channel guide and instructions on how to work tv. They do not provide things I think they should but someone previous to us bought a soft sided cooler for the beach and we bought 2 boogie boards, 2 lounging chairs and 2 beach chairs that we left behind in a closet for future renters to use, a small expense on their part which would have been nice as we spent $80. Restaurants-highly recommend Sam's Ocean View, Kauai Grill, Verde, Oasis on the Beach (though prices high). Buy The Ultimate Kauai Guidebook for the best tips and ways to access unlabeled beaches. Na Pali Catamaran for boat tour, book prior or as soon as you get there. 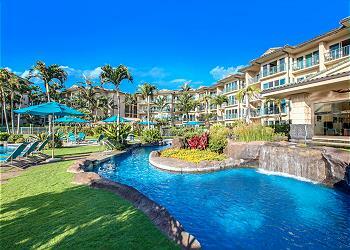 Location of Waipouli condo is good, with ample of decent restaurants nearby. The beach at Waipouli however is not swimmable. and the pool has too much chlorine. The resort is well managed, people are very friendly, and Kauai is just a great vacation destination. We were pleasantly surprised on how nice our units were. It was like combining many comforts of a luxury hotel with a condo. The staff were always friendly and willing to help. The property was constantly being maintained. The added convenience of shopping across the street made this a home run. We would happily return. Resort was well maintained. A little too big for my preference due to wanting more of a quiet experience. A great place if traveling with kids. The ocean was a little rough on site but could travel close by for swimming. Beach was long enough to walk in the morning, but watch for jelly fish. The resort was within walking distance to groceries which was nice. The pool water was cold, and crowded sitting areas. Hard to find a quiet spot. This condo was so beautiful. It looked completely remodeled and updated. Two lovely bedrooms and three huge bathrooms. What could anyone ask for. We loved it. Loved the grounds, the pool was wonderful. So fun to watch the kids go down the pool slides. Great time! Everything was perfect and in order. Very comfortable place and beds. Clean rooms, lots of space. 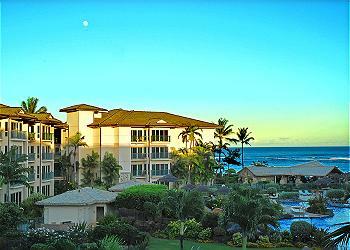 We stayed at the Waipouli Resort and had a great time. The location is very central and the on-site amenities were great. There is a wonderful pool and bar/restaurant beachside. I would highly recommend. D 304 has wonderful full view of the pool and ocean. Having washer/dryer on site was very helpful. 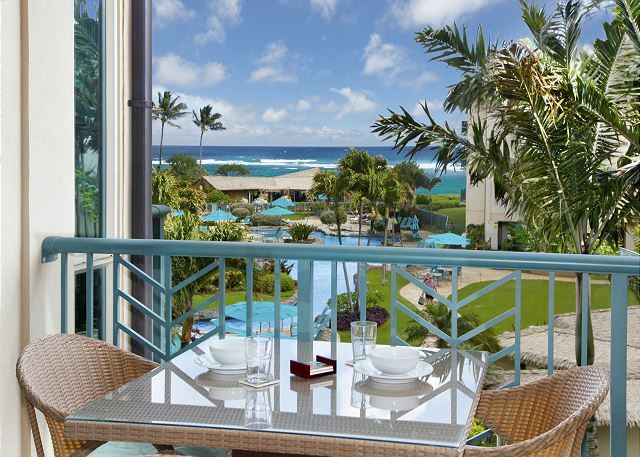 The lanai was enjoyable for meals,relaxation and view. Kitchen appliances were plentyful for every need! Beautiful, clean, quiet and friendly environment. Close to shopping and make sure to rent bikes at the gift shop downstairs. The bike trail is amazing and great morning ride, even if it's raining. Love this place we may buy in this building. It's really brethtaking! Thank you for everything! We loved this property and the pictures did justice to the actual product. I would recommend getting a pool or ocean view, as I would have been unhappy with a parking lot or strip mall view. I did appreciate having the grocery store and the Starbucks right across the street. 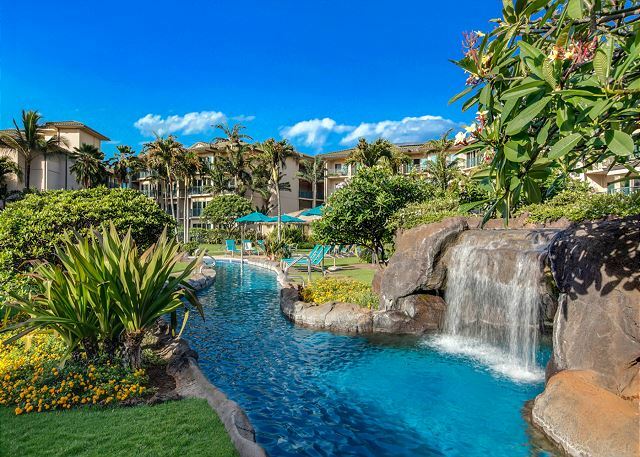 I really like the location of this property as you are no more than 30 minutes from the North Shore or Poipu - both of which we visited very easily. The restaurant is expensive, but excellent quality. Awesome Mai Tais! The room was very clean and well appointed. We would definitely come back! we rented the unit for a week and shared it with another couple. this was our second year and it was perfect (again). Great expierience recommend too friends and family live it here the best yet! Waipouli Beach Resort was incredible! Beautiful accommodations in a great location. Loved the whole experience and will definitely stay there again if we return to Kauai. The condo was superb and the management was even better. We ended up having some problems unrelated to the property but the management bent over backwards to help us. Great pool- especially good for families. Quiet at night. Definitely want to stay here again! Cool took with a view. We loved everything about our stay at the Waipoluli Resort. Was perfect for my family. My family of 5 had a fantastic time during our 7 day stay. This property was perfect for us. The room contained everything we needed. This location is ideal. Some days we headed north, some days south. It's great to be less than an hour away from anywhere on the island with plenty of shopping and restaurants within one mile. 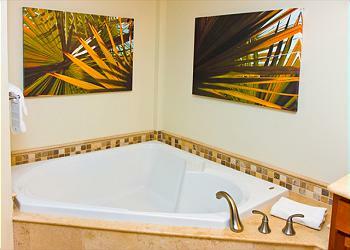 The beds in this unit were super comfortable, the kitchen exceeded our expectations, and the bathrooms were huge. No complaints from me; in fact I've already recommended this unit to two other friends that are planning a trip there, and we will stay there again when we return to Kauai. The pool area is awesome! 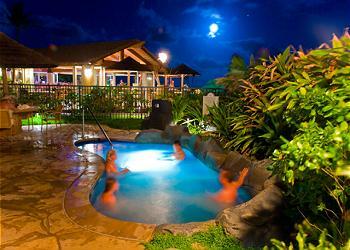 Relaxing in those hot tubs after a day of island adventure was priceless. We were very impressed with how well the grounds were maintained. If you stay here - you will NOT be disappointed. This is the greatest place to stay. Beautiful and the view is spectacular. We had a great time and the condo was a dream place to stay. Clean, bug free inside and out. We certainly made the right choice in staying here on the island. We were to leave on the 15 of May by 10:00 but our fight was not out until 10:00 pm. The management accommodated us with an extra day no charge so we could enjoy the pool the day of our departure. Wonderful and great customer service. Restaurants are pricey. Take money for that. You can cook in the condo as they have provided ever amenity you could want for making a spectacular dinner. The place was better than expected and I expected it to be pretty good. Amazing views of the ocean, very spacious condo, access to food stores, restaurants and others shops without any sort of urban feel. Very good access to the other parts of the island as well. I'd go back in a heartbeat. Overall, a very nice stay in unit D304. 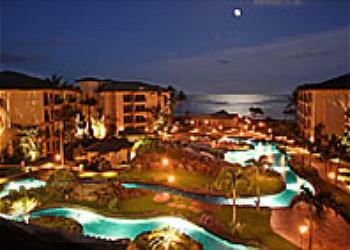 Love Waipouli Beach Resort and stay there every time I visit Kauai for the location, convenience, pool, beach, etc. Kitchen could have used more dishes and glassware (i.e. only 3 wine glasses for a condo that claims to sleep 6). Furniture was a bit worn and dated. Liked the extras in the unit (i.e. beach chairs, cooler, snorkel gear). I've stayed in other units with much nicer furnishings for less money, so not sure this unit is the best value overall. Aloha Heidi, Thank you for your feedback. We have updated the suite with more wine glasses and our owners are in the process of purchasing a new suite. Thank you for being our guest! Loved the condo, loved the resort. We were very impressed with the information provided by the management company via email prior to our checkin; made our arrival so easy after a long trip. It was nice being located halfway between the north and south shore. Hated to leave this beautiful, friendly island. This was a fabulous unit with an ocean and pool view. The full size washer and dryer were used daily. The instructions were clear and easy to follow. We would absolutely stay here again. Everyone, especially Patrick, was friendly and quick to respond to any questions we had prior to our visit. This timeshare was absolutely georgous, with a nice view of the pools and the ocean beyond. Being located up the east coast a ways in Kapaa means a short drive to either the north or south coast attractions. We had a great week here, and would highly recommend it to anyone. Very comfortable with beautiful view. Perfect layout for my wife and I and our two teenage boys. The pool was terrific, the grounds beautiful. We ate at many nice restaurants on the island during the week, but our favorite dinner was at the Oasis...great food, service and setting. Thank you for a lovely stay. Great view of pool and ocean from all balconies. Gym was well equipped and the pool area was beautiful. Condo was clean and comfortable. One of t relaxing vacations in a long time. No surprises and the condo was BETTER then expected. So convenient to shopping, airport and restaurants. Definitely going back!!! We enjoyed everything about the resort. 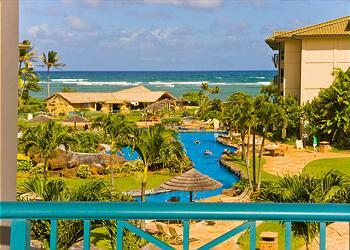 We have been to Kauai many times and found the Waipouli Beach Resort to have everything we expect when on vacation. The only negative thing that occurred while we were there was both adult jetted hot tubs were not working. We loved the Oasis -would have loved it even more if there had been music more than once a week. We will come again. This is our second time staying at this resort and the same room. We loved it so much that we brought the rest of our family members and rented another unit. This resort is hand down the best compared to any hotel we've ever stayed in. 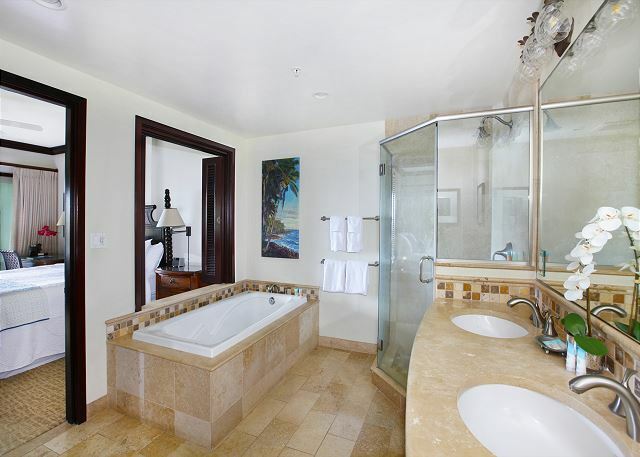 This luxurious suite has 2 very comfortable master bedrooms and each has a bathroom with huge tub/spa. It has all the modern appliances with 3 flat screen TVs in each room, high-speed wireless internet, and the only hotel that we've ever stayed in that has its own washer and dryer. The pool is beautiful and has a lazy river lined with waterfalls, 2 water slides, a kids sand bottom shallow pool, 2 jacuzzis, and 1 jacuzzi just for kids. 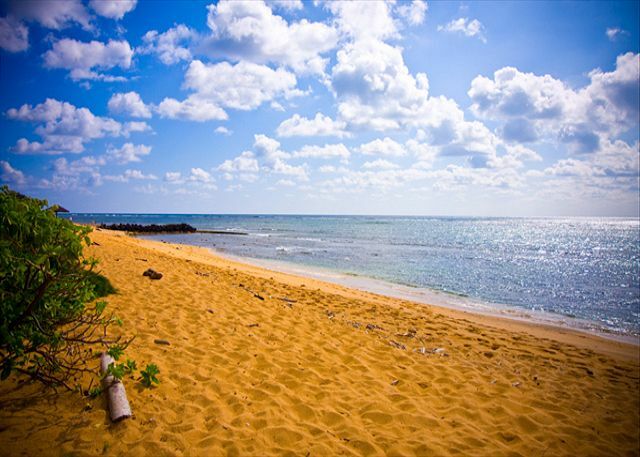 It is one of the few resorts in Kauai with its own private beach. We will definitely come back again and again. Makes us want to buy property at this resort or time share. Josh from Kauai Exclusive management was very helpful and "hooked us up" with a great deal and was very accommodating! The property was even more than the pictures reveal. It was a wonderful experience. The delivery of the fresh orchid was an added special touch. I cannot say how much we enjoyed staying at this condo it was a wonderful location and so relaxing. Excellent facilities and spotless condo. Spectacular service. Had an excellent stay. Couple little things...the toaster is busted and the safe is not operational. Not a big fan of the 11 digit code to enter the pool. And of coarse by biggest pet peeve of all:) NO sharp knife or knife sharpener. All little stuff. Beautiful spot had a wonderful time.....Thanks! We enjoyed our visit at lovely Waipouli Beach Resort! The property was beautifully furnished and in excellent condition. Even though it was overlooking the pool it was not noisy. A minor suggestion would be to get a small wall mounted shelf to hold the electronics so that the table can be used as a dining table and not just as a console. Location of this resort could not be better. Grocery store across the street is very convenient and resort is centrally located to all other points of interest on the island. The grounds of the resort are kept meticulous and the pool offers fun for all ages. 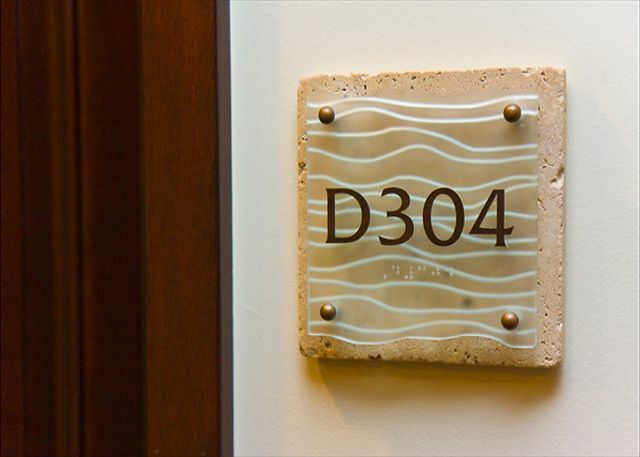 Unit D304 has very good amenities and a beautiful view of the pool and ocean. The onsite restaurant is good and is convenient for lunch or dinner when you don't want to cook or leave the resort. We would definitely stay here again and without hesitation would highly recommend to others. I stayed in D304 for 2.5 months and could not be happier with my choice. The condo is exactly as seen in the pictures. The view from the patio is night you have the torch lights , sounds of the ocean and all the wonderful bird song. The kitchen has everything you need including some great platters and plates for entertaining.The beds were incredibly comfortable. Even the air bed was great when I needed it for company. The sand bottom hot tub was fabulous. The pool was great although on the cold side. Location cannot be beat!Dealing with Kauai exclusive was effortless and Josh was incredibly responsive. He really wanted to be a great host and he succeeded. I have stayed in three other resorts on the island and this is the best on so many levels.I would absolutely recommend it to all my friends. Very good use of space for the value. Very nice pool and beach area. Should have unbrellas for the beach. 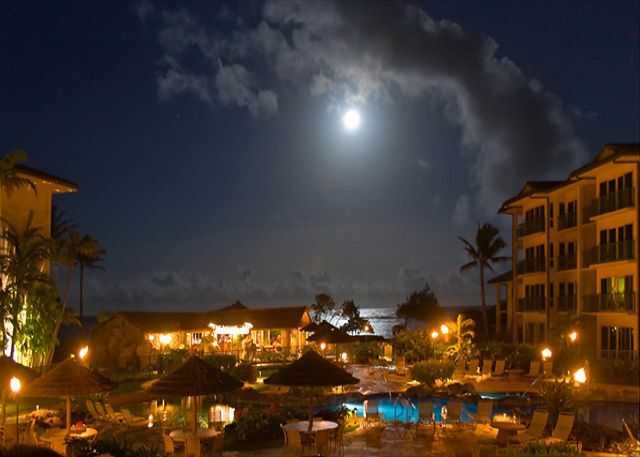 Our experience with Kauai Exclusive Management and the Waipouli Beach Resort was fantastic. The impressive pictures shared on the website are the exact views you'll see once you arrive. The beds were extremely comfortable. The bathrooms were large and clean as was the kitchen. The lazy river pool was perfect for relaxing. The resort had easy access to the beach and shops. And being located in Kapaa placed it within reasonable driving times to all parts of the island. In addition to the wonderful property, I highly recommend utilizing Kauai Exclusive Management. They were professional, responsive and very helpful. It was a 5 STAR visit! This wasn't my first trip to Kauai, but my first stay here at the Waipouli Beach Resort. What a beautiful property and fabulous condo! Everything was perfect, from location to the room, D304 must have the softest beds in the world! We loved everything about our trip, and especially where we called home for the week. The grounds are beautiful, the pool area is perfect for relaxing and never feeling like there are too many people there. The location was great, being right across the street from the grocery store, a few restaurants and shops made it easy to get the things you need easily. The condo was amazing, beautiful rooms, kitchen and living room, with everything you need. 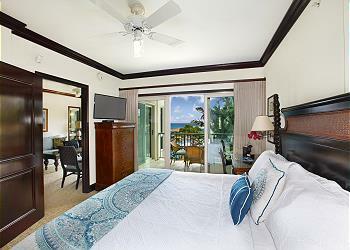 From the minute you get to the resort you realize you are in for a wonderful luxurious stay. The resort is top-notch ! everybody who works there is very knowledgeable and helpful. This place delivered as advertised.......beautiful furnishings: 2 king size beds, lcd TV's, full kitchen, washer/dryer....all within a beautifully maintained resort.....especially enjoyed the sandy bottom hot tubs and of course, the view. The room was excellent. There was plenty of room for my family of 5 and the pool was a great respite after enjoying the many things to do on Kauai. One shout out to Christen (concierge). Every excursion and dinner recommendations were right on. Between the resort and excursions, this was by far the best vacation my family has been on. 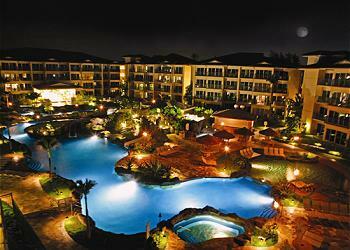 We strongly recommend the waipouli resort!! Our stay was very good....we enjoyed our unit and the hotel overall....the staff were friendly and Josh was there when and if needed....we found it to be a good location as basically about half way between Poipu and Princeville so easy trip to either place....we were there for a wedding and several people stayed at the hotel and we basically got positive responses from everybody....the pool area is awesome....we would definitely go back to this complex and the same unit. The resort did not disappoint. Rooms are beautiful and spotless. Pool and grounds are amazing. Our whole family loved it and would love to return. Our vacation was supurb. The condo was very well supplied, comfortable and the view out through the pool area and to the ocean was spectacular. There is nothing better than falling asleep and waking up to the sounds of waves crashing on the rocks. We were surprised to get yelled at by another resident at 630 pm when we were settling in on the patio for our first dinner on the island as a family. If you are going to have families in this complex then the residents are going to have to expect happy family noise at dinner. He was very rude. With that exception it was a wonderful place to stay. Our stay in Kauai was the best vacation ever taken. The property management made the experience wonderful from our arrival to our departure. 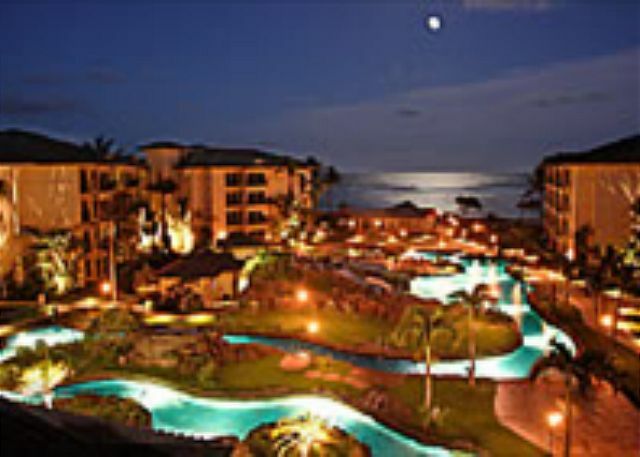 After you stay here for the first time, #1 you want to come back again to Hawaii #2 you want to stay in the same location. Beautiful facility and location! I would not recommend having more than 4 guests though. The sleeper sofa has been abused and is most uncomfortable...feels like sleeping on rocks! The beds in the bedrooms were like heaven, however. 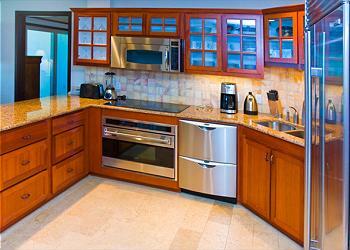 Having a kitchen as well as washer and dryer were fabulous amenities! The view from 3rd floor was breathtaking. And having morning coffee on the balcony was so nice!! The Oasis restaurant had great food and very pleasant waiters and waitresses. Gorgeous view of the ocean! We also had a child with us. The pool Wasatch favorite hang out for him! We attended a wedding reception at the Oasis. It was perfect from beginning to end! I would definitely return! What a wonderful experience! The grounds are beautiful. The staff was outstanding . The unit took our breath away---What a view! This property was centrally located for all of our adventures around the island. I would not think twice about referring a friend to this location! Thank you again to Joshua and his staff! This resort was lovely, conveniently located to grocery store, airport, activities. Very family friendly. Really enjoyed the stay at the Resort. Friendly Staff, clean, large rooms, great pool and amenities, good location, central and close to shopping. The beach, although nice, was not great for swimming. We would for sure stay at the Resort again. The resort is as beautiful as the pictures. The kitchen is great too. Lovely view of the pool and ocean. We had a great time! Absolutely gorgeous and spacious condo with high-end everything. 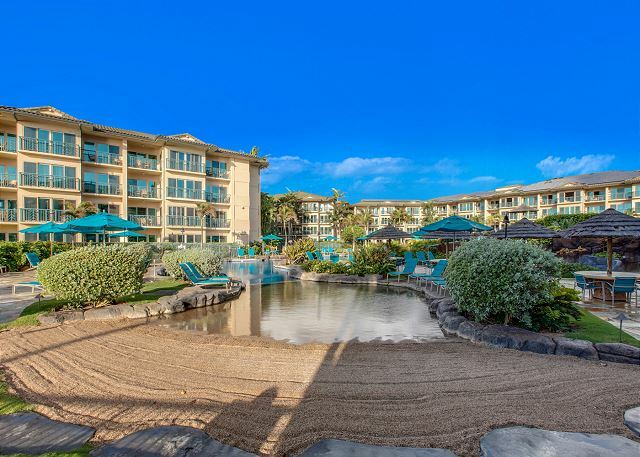 Walk across the street to Safeway and take an easy 2-minute stroll past the pool to the beach. There are endless beautiful places to check out on the island, but this place has everything you need either on-site or a short walk away for a perfect stay. Highly recommended. We spent 10 days here with 3 small children. The condo is beautiful and very nicely decorated. Great kitchen, nice views of the pool and ocean beyond. The pool area is the best, our kids loved the kids splash area, plus the slides, "river" and hot tubs. And having the supermarket across the street is really helpful. Great location on the Island too. Close to Hanalei in one direction, Poipu in the other. We'd definitely recommend this complex and unit. And the service from Joshua at Kauai Exclusive Management was excellent. Very helpful.